This is my take for Card Patterns #7. Yes, yet another Sugar Nellie stamp. I have so many of them still 'un-inked' and I am ordering somemore. At the rate I am ordering my stamps, I dunno if I am going to use them all at least once but the temptation is just too great and my conclusion is to stop surfing, stop looking at all those pretty creations from the stamps and you'll be able to stop buying. That's close to impossible for me! I hardly explore Shanghai now since we have been here almost 1.5 years now and the kids are either in school or napping and I can't take myself of the net!!! Oops...off topic...back to my card. I decided to go for a distressed look. I had wanted to put flowers all around the oval shape cardstock but I like the way the distressed papers look so I decided to go simple on the embellishments, so I can show more of the distressed papers. Just plain simple distressed papers but one of my very early attempts at distressing so I liked how they turn out. My original idea was to create a 'flower swing' effect. Anyhows, I chalked the background with yellow and green chalks and quite like the outcome. This is my first 2 page layout. I put together pictures of Asher in various sleeping positions from birth till now. Asher will turn 2 this saturday and yet he is still like a baby in many ways. He still needs his regular naps and gets really grouchy and fussy when he starts to get sleepy. Since young, Asher has always been a sleepy baby and would rather forsake food for sleep. Adah's the opposite, she would rather fight sleep and stay awake to play as much as she can. It's a simple layout. I intended to put my new sewing machine to us and sew the papers in the background together to resemble a quilt but the stitches were terrible. I think it had to do with the tension in the top thread and no matter how I adjusted the tension button, the stitches just didn't turn out the way they are supposed to, so I ended up stamping stitches on the papers. I thought there were so many photos to look at so I went simple on the embellishing so as not to 'overwhelm' the viewer too much. I created this card using my favourite Sugar Nellie Stamp above! Isn't that little girl so sweet. Mum loves flowers these days, never failing to go to the market on weekends to buy flowers for the house and the little girl looking on at the flowers reminds me of Mum and her flowers! Overall, I'm quite pleased with the end results cos' I took only 2 hours to finish it, very therapeutic despite the cold I'm nursing! This is my take for Cute Card Thursday Challenge #51. Its their birthday week and there are loads of prizes for grabs. The theme is on celebration and I liked the sketch very much. It gave me the idea to make a bookmark together with the tag for my girl's classmate. She is a good reader at 5 and loves reading, spelling and talking. Her birthday is just around the corner so this card shall go together with her present- a book, of course! I found the big felt flower in a market here. There were 8 of them stringed together like some hanging ornament, but I just stripped them out and used them for my crafts. They make good embellishments especially if u want to draw attention to something, but because there are so many flowers and I wanted focus on the girl, I toned down my sentiment and just stamped 'Hugs'. The sentiment stamp is from my Clear Dollar Stamp collection and the girl is from Whiff of Joy's Spring Kit!!! I just wanna share that I received my parcel from Ericia of YSS!!! She has been so sweet, tracking the parcel for me, apologising over and over again and updating me whenver she has news and finally re-sending the parcel when it was sent back to her in a battered state. In my anxiety and excitement, I jsut ripped open the box and forgot completely about pictures! I send Ericia an e-mail immediately to thank her and share my joy at finally receiving my parcel. Order was placed early december if I remembered correctly and it took 4 months to finally reach!!! Thank you Ericia!!! This is my take on the card sketch #42 by Friday Sketchers. It is really very sweet and girly so I thought I would do a 'congratulations' card for a friend who is due to deliver her second baby girl next week. I met Wing at a summer camp class that I had signed up for Asher and myself last summer. It turned out we were living around the same estate and subsequently, both our kids went to the same playgroup class and we met again! Wing has been really helpful, offering me lifts for marketing sometimes especially since she knows we do not have our own transport. I used the 'Postbox' Sugar Nellie stamp for the image. I must confess that I am not a 'girly girl' kind of person but I was totally impressed by this range of stamps from Sugar Nellie. The images are so sweet and lifelike and well- drawn. Its no wonder that their popular stamps are sold out almost all the time! Another plus, I like the size of their images too! Back to the challenge, I have inverted the sketch 90 degrees anti- clockwise and replaced the flower motif with a cute romper sticker I found amongst my old stash again! 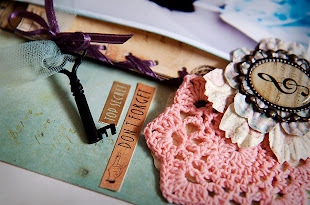 So I am definitey feeling satisfied that I have been using up stash in my current projects...I stamped on the florishes at the sides too...hmmm, love the birds there. I have sworn off more purchases except for papers and possibly, stamps, so I am now using all the stash accumulated just over 1 year of starting this hobby. I had wanted to do up first year albums for both the kiddos, so I ended ordering 'monster baby kits' on ebay a few times and now I have 2 cartons of baby related papers and embellishments, etc! No wonder my husband says I could easily buy a rolex by now considering all the amount I have spent on SB! The sketch I used for this layout is from Pencillines Sketch #124. Pencillines provides sketches weekly for inspiration and I really like their sketches. Simple and clean. 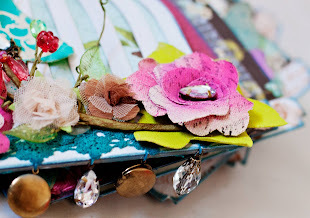 Although sometimes I do go overboard with all the layering and embellishing. This layout was completed in a night. I love how much stash I have used up and yet the layout does not have an over-cluttered look. And I love that blue colored paper! Wheee!!! I am on a high after completing my first craft project in a month! We have been back in Singapore for the last month, staying on for another 4 weeks after Chinese New Year. I thought I had completely lost my mojo so I was delighted to be so inspired after blog hopping amongst my favourite stamp challenge sites! There are so many challenges that I wanna participate in that I decided to try my hand at combining the Color Throwdown challenge as well as the Whiff of Joy Challenge for Guest Designer spot. Then I came across the Cupcake Craft Challenge, saw the bunch of daisies and decided I had to use my favourite flowers from my stash. I had discovered them at a crafts market here in Shanghai, so sweet and pretty and I am never sick of using them! I could not find a light yellow/ beige colored paper amongst my stash and finally decided to use the bright yellow paper to match the daisies I had intended to use! 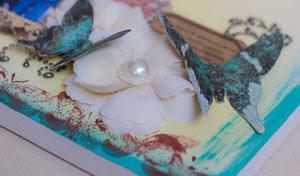 The stamp used here is from Whiff of Joy's Spring Stamp Kit. I took a gamble and placed a pre-order for the kit after seeing only part of one of the images. I have been impressed with their stamp designs so far and true enough, I wasn't disappointed!!! I lurveee my Whiff of Joy images and their sizes are just right for cards and even scrapbooking layouts!! !I shall try to use them on my layouts soon, just have to brainstorm on how to incorporate them in! Speaking of scrapbooking, I am absoultey guilt stricken at how much I have spent at the LSS in Singapore when we were back. And on top of that, I am expecting more stash from YSS. One of my parcels sent around Christmas had been sent back to Ericia, stating 'bad address'. But Ericia told me that she had wriiten the exact same address on another parcel which I had received!!! Anyway, I am totally impressed with Ericia's patience and customer service, so I would strongly recommend YSS to friends now! I hope I will receive my stamps from Simon Says Stamp. It has been 2 months since Heidi sent out the stuff and its not here yet. On top of that I had just placed another order with them too! Add that to my win for Lotus Paperie (hip hip hooray! My first win! ), I should have 5 parcels arriving!!! Will take pictures and share them with you guys.